When you go on a camping or hiking trip or other wilderness adventure, there’s already a lot to do and a lot to prepare for: what to eat, how much water to bring, what kind of shelter you’ll need, how to get there, not to mention many other things to keep in mind! Making sure to bring along a game or two might not seem very important by comparison. But you never know when you’ll find yourself with a little-unexpected downtime, and you want to do something fun with your camping buddies! Whether it’s dark and the campfire is going, or the weather has got you stuck in your tent all day, or if you and the kids just need something low-key to recharge after a busy afternoon, a board game or card game can be the perfect solution. These games described below are all highly portable. Many are card based, like Monopoly Deal and Cards Against Humanity. Some require no board at all, like the tile-placing game Hive or the word game Bananagrams. Best of all, none of them are burdened with lots of fiddly, easy-to-lose components. So, toss these games in your backpack for your next outdoor adventure! 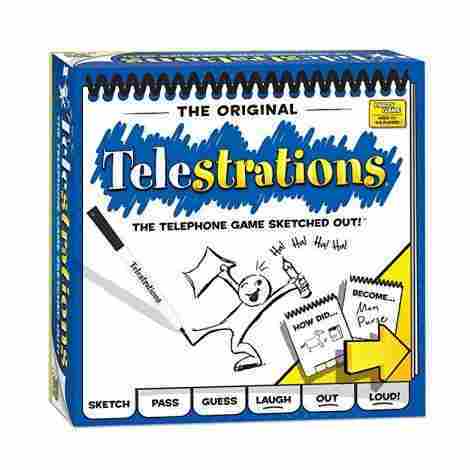 If you can hold a pen or pencil, you can play Telestrations. It's a drawing game, but you don't need any artistic talent to enjoy it: the harder it is for other players to guess what you've drawn, the greater the fun! Imagine the game Telephone, but instead of passing words around the group, one player draws something and the other players make their wildest guesses as to what it could be. What you draw is determined by a roll of the die. Once you’ve drawn it, however, you must pass it to the next player, and they have to write down what they think you were trying to draw. Very quickly, the original phrase or word you were drawing has been hopeless, hilariously distorted into something else! All you need is enough space for the drafting pad that comes with the game, and you’re ready to play – at home, on road trips, or sitting together with friends and family at the campsite. Great for an icebreaker activity! This word game is all about making your friends laugh, maybe a little uncomfortable. Each round, the dealer turns over a card with a prompt or question, and the players must select the card in hand with the best, wildest, or most outlandish response possible. Testing the boundaries of good taste is all part of the fun! If you’re going on a grown-up wilderness adventure, Cards Against Humanity can be an uproariously good time! The motto of the game is “a party game for horrible people”, and how far you take the humor is up to the limit of your imagination! Cards Against Humanity has a question-and-answer format: the dealer presents a prompt and the players all look at the cards in their hands for the most hilarious answer or response possible, then present them to the group. Everyone votes for their favorite response, and the winner of the round scores a point! The subject matter of Cards Against Humanity is intended for adults; no topic is off limits, and half the fun is laughing at the cards not chosen each round. The motto of the game is “a party game for horrible people”, and how far you take the humor is up to the limit of your imagination! 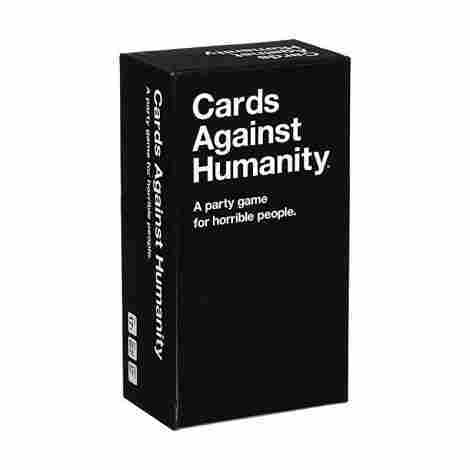 The box set of Cards Against Humanity is a bit more of an investment than some of the other games on this list, but it comes with 600 prompt and answer cards, and the second edition includes 150 more prompt and answer cards than the first edition, so it’s 33% more horrible and 33% more fun! A potentially offensive experience, touching on issues like gender, race, war, etc. 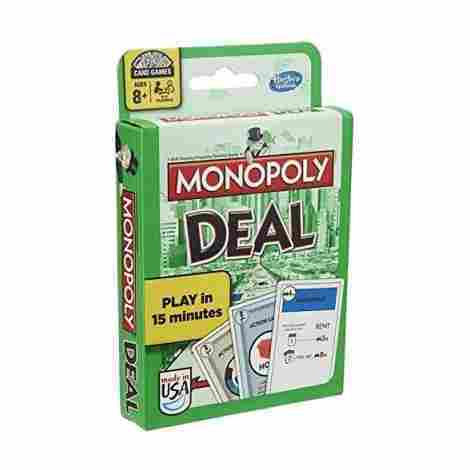 Monopoly Deal is a fast-paced game of real estate trading. If you enjoy the original Monopoly, you'll love this version's easy setup and quick playtime. It's portable enough that you can take it with you, and a bargain addition to your board game collection! Monopoly is an engaging, classic game of strategy, but both setup and actually finishing the game can be time-consuming. Monopoly Deal boils down the core elements of the original game into a handy, card-based format that’s easier to manage and makes for a quicker game. Taking away the board doesn’t take away the complexity of the game, or stop you from striking deals with other players, swiping properties out from under your opponents, and raking in the cash! Monopoly Deal has one of the lowest prices on this list, so it’s easy to give this updated classic a try! Monopoly Deal has the lowest price of any game on this list, so it's a great holiday gift, stocking stuffer, or last-minute impulse purchase before your next big adventure! The rats and cats have donned their finest and are ready to party! Trade cards with other players, get the lowest possible score, and dance your way to victory! You will have a great time with this one, and not be disappointed! 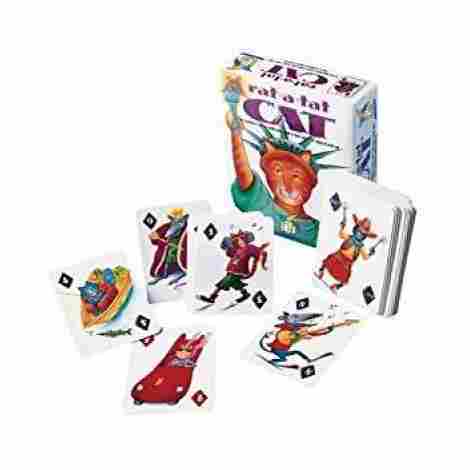 In Rat a Tat Cat, players have to finish each round with as many points as possible in a four-card hand. Learning the game will stretch younger players’ number fluency, and the colorful art features rats and cats in suits and dresses that are too silly and charming to pass up. Players must discard cards each round while keeping an eye on what other players might be up to. Getting the hang of this guessing game is a tricky, rewarding challenge that players of all ages can master. Price-wise, Rat a Tat Cat requires a little bit more investment than the rest. But its charming illustrations and family-friendly replay value make it a great game for everyone to play! Cats and rats in suits and dresses. This is great! Each player controls a wizard wandering the halls of the labyrinth, seeking treasures and steering clear of monsters and each other. This game is more expensive than most of the others on this list, but it’s family friendly and its strong themes make it engaging for players of all ages. 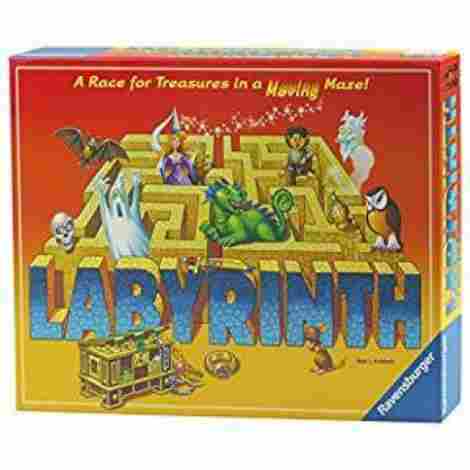 With brightly colored, fantastical game components, and fully illustrated game cards, Labyrinth is a robust adventure game for the whole family. In terms of price, this game is in the middle of the list. Break out the banana! Shake it up, pour out the tiles, and start unscrambling words. It's a race to rack up as many words as you can, and when one round is done, load up the banana and shake it up again! 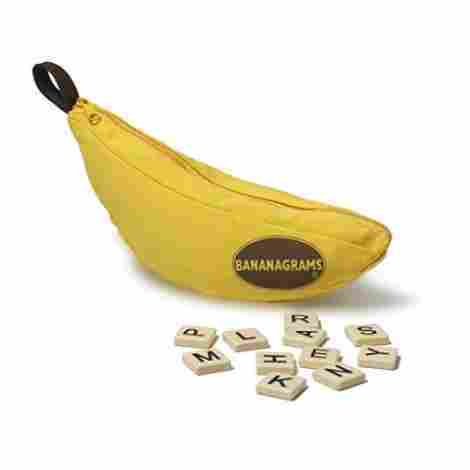 Bananagrams rewards quick thinking and imagination, and setup is a snap: you just unzip it and dump out the tiles! How fast can you unscramble a handful of tiles into a word? Can you find more words than your opponent in the allotted time? The game comes in a soft, plastic container shaped like a banana, naturally. Carry it with you, in your backpack or in a suitcase on your next trip: it’s not much bigger than an actual banana! Bananagrams is one of the most inexpensive games on this list, and its simple, long-lasting game components will hold up to plenty of use. Play it while you travel or out of doors. 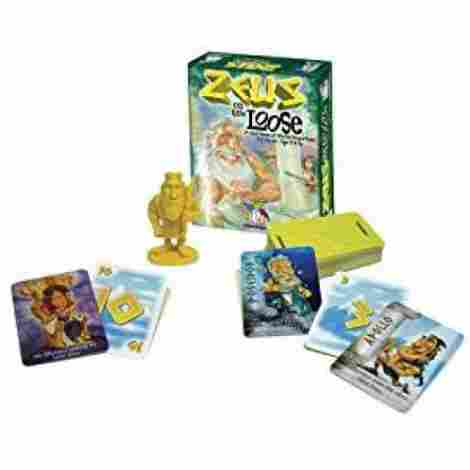 Mount Olympus is in an uproar: Zeus, king of the gods, has abandoned his throne and escaped to the mortal world! The Olympians - gods and demigods - need your help to bring him back, and whoever can return the thunder god to Olympus will earn the Olympians' undying gratitude. While many older players will be drawn to the game’s ancient-world mythical elements, younger players may be hearing about colorful legendary figures like Zeus and Hera for the first time. If they like the game, reading ancient Greek myths will help them develop a deeper appreciation for the characters and their stories. If you can count by tens, that’s all the math skill you’ll need to play this game. Adults can get deeper into the strategy while younger players enjoy the challenge of tracking their score throughout the game. This is one of the more inexpensive games on the list, and with colorful, cartoon-illustrated cards and no board to worry about, this game is a good fit for playing outdoors. With a quick, average play-time of only 15 minutes, it can be a great pastime when you need something to entertain the kids awhile, or you just need a fun, little break from the day! Everybody likes ancient Greek mythology! Line up all your blocks to win, but be careful - blocks of a single color can only connect at the corners, not the sides. Each block you place brings you a step closer to victory, but you never know when your opponent will cut you off, or when you'll find yourself trapped in a corner! Blokus may look simple, but it’s competitive and you can box yourself into a corner if you aren’t careful! When you make your move, two of your own pieces can only touch on the corners, not along an edge, so your options get more and more limited as time goes on, forcing you to confront your opponents over every inch of territory. You win a game of Blokus by having the least remaining pieces when there’s no more room on the board. Once younger players get the hang of the rules, they will want to play again and again to see who can conquer the most territory! 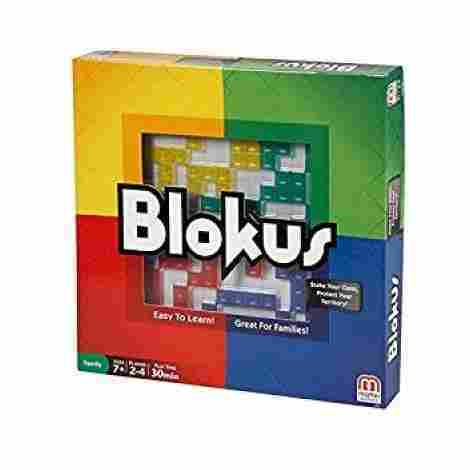 Blokus is one of the lowest-priced games on this list, so it’s easy to add to your collection in time for your next outdoor adventure. Its geometric playing pieces are sturdy and can stand up to the elements a little! 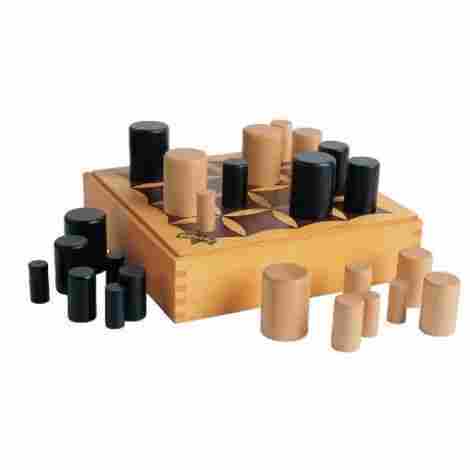 Quick to play - each player has 21 pieces, and once they’re placed, the game ends. Now's your chance to play with bugs - protect the Queen, deploy your warriors, and keep the hive alive. Whoever can surround and capture the enemy Queen will be the victor, so hatch a plan and get playing! Play With Bugs, In Nature! The game’s portability is a perfect fit for its insect theme. Take it with you into the wilderness, to the beach, or anywhere in the great outdoors, and you can place your tiles on any surface you like - they’re made of a smooth, molded plastic that is both easy to clean and sturdy enough to keep from blowing away if nature gets a little natural on your game! 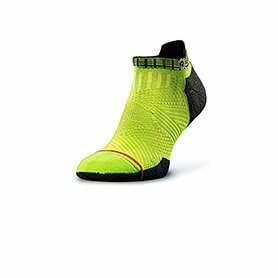 Hive is at the higher end of the cost range on this list, but it’s got high-quality components and lots of replay value. 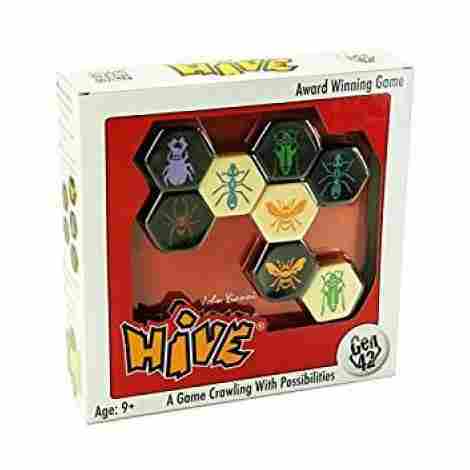 After getting the hang of the game, you can incorporate Hive expansions like Hive: Pillbug, Hive: Ladybug, and Hive: Pocket Edition, which add new kinds of bugs and new rules to play. With its strong nature theme, moderate price, few components to worry about, and rules that are simple but flexible, Hive (which comes with its own travel pouch) is an excellent addition to your camping “go bag”! Line up your pieces to win, but first you'll have to outwit the others, who can block, corner, and gobble up your pieces if you don't do it first. This is an easy game to take on the go, and lightweight enough for little hands to carry. Simple game setup means you can get started easily when you’re ready to play. Gobblet tests players’ spatial reasoning and strategic thinking, requiring you to outwit, outmaneuver, and of course, eat your opponents and their pieces. Hollow playing pieces mean that when larger pieces capture smaller ones, you can put your big piece directly atop the small one and “gobblet” it up! Gobblet’s high-quality components put its price tag at the higher end of this list, with polished, wooden game pieces, a painted, beautifully textured game board, and best of all, you can fit all the pieces inside the board when you’re done. There is a great variety of portable board and card games you can bring along on your next hiking or camping adventure or road trip. Whether you’re bringing the kids along and need something for all ages, spending time with extended family and want a game that’s quick to pick up, or just getting away with friends who like games, there are plenty for every vacation occasion! Games like Hive, Bananagrams, and Telestrations are especially portable and easy to set up in a small or uneven play area, while games like Blokus and Labyrinth require a table or other uniform playing surface for the best experience. With the exception of Cards Against Humanity, all games on this list are family friendly, but at the same time, none of them are “childish” and will be welcome at the grownup game table too!